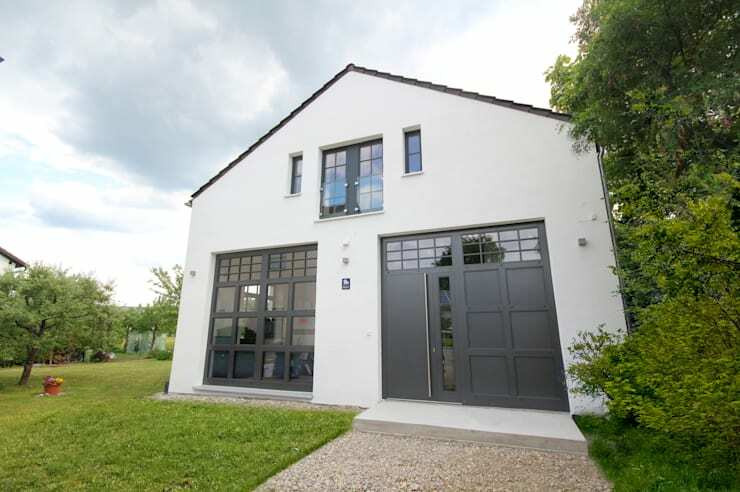 This old garage was renovated into a stylish and modern home. It has a bold black and white face that looks out over its ample green space. In keeping with the exterior black and white theme, the inside is modern and high contrast. 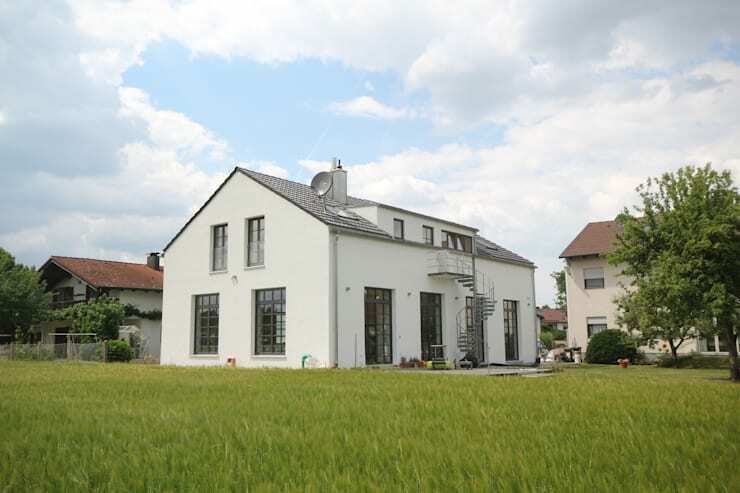 Architect Planungsburo Schilling did a thorough job with this renovation; there's no sign it was ever a garage! Lets take a tour. Those big windows have been made so sleek and detailed that you can forget they were once garage doors. In particular, we love how dramatic and tall the front door is (on the right window) with its long handle. The architect has also completely replaced the roof, and given the front a fresh coat of white paint. This wonderful focal point of the home is combining all of our favourite features of modern fireplaces. It has bold geometrical design, stark white colour, and glass on both sides so the fire can be enjoyed from both spaces. It's also the only separating wall in the open-concept first floor. It gives enough privacy to make the living space feel distinct from the dining and kitchen, but it doesn't cut across to make the home smaller. From the other side the fireplace is made to look longer, to keep the space feeling symmetrical. The industrial lights and the chains hanging from the ceiling are the only reminders of the space's past as a garage. But these character elements blend seamlessly into the modern style with their all-black look. We love how soft and warm the hardwood flooring looks and the matching kitchen table is an elegant addition. 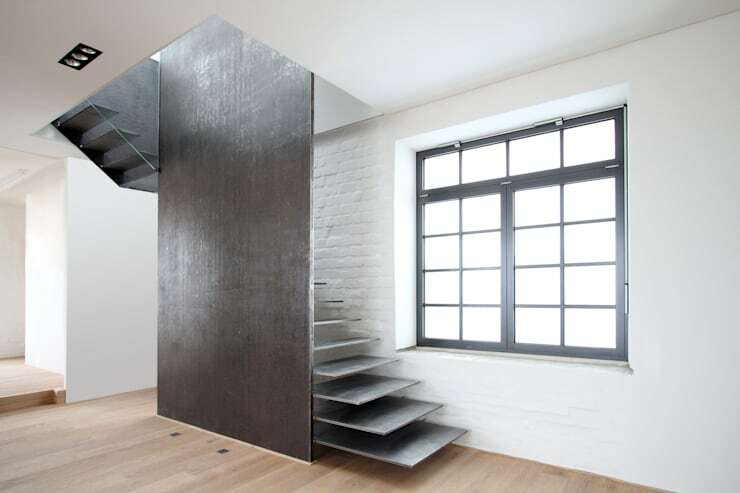 This beautiful staircase feels like an industrial spine supporting the back end of the home. It actually weighs five tons and had to be dropped into the home through the roof, slowly, by a crane! It's a good thing that the architects were planning on replacing the roof anyway. All of the trouble was worth it though. These stairs feel shining, secure and stylish. Staircases are overlooked far too often! Get some ideas on how to add style to your set of stairs in our gallery here. See that dormer window on top of the metal staircase? That was added in when the roof was replaced, and we think it gives the home some flair. We have another stylish renovation waiting for you here, it's a dull 70's bungalow that has been absolutely transformed! What do you think of this home's key feature: the fireplace? Let us know in the comments!